As part of its women empowerment programme, the Marian Women Cell arranged a class on 2 December 2016, in which the Chief Guest Adv. 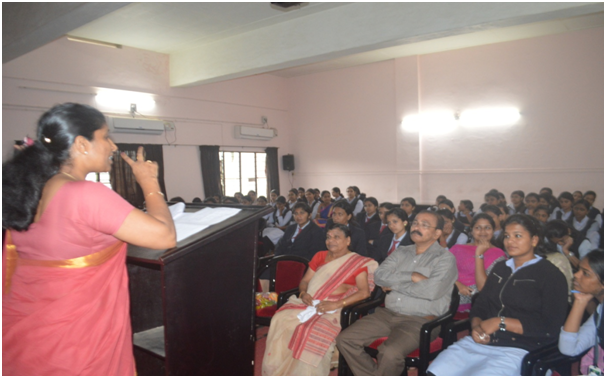 Seena S. Nair delivered a talk on ‘Women and Legal Rights’. The talk, besides shedding light on a number of judicial laws of India which are intended to protect the rights of women, also underscored the determination of the Indian judiciary to uphold the dignity of women. In the interactive session that followed, the queries of the girls mainly reflected their indignation at the Supreme Court’s verdict in the case of Govindachammy who was not given death sentence for the heinous crime that he committed. Won’t this give a wrong message to the young men of today?